Tavares, FL June 20, 2014 - Updated Monday, June 23, 2014 - contains opinion and added documents. A Peat Harvesting project known as the Goose Prairie Peat Harvesting Project (300 out of 600 acres north of Lake Eustis by HWY 44) is in process of getting approval from the Lake County Board and is scheduled to be discussed at the Tuesday, June 24, 2014 Lake County Board meeting. It is listed on the agenda under tab 23 for Planning & Zoning issues. Unfortunately, you have to download the entire 1176 page "Packet" file to find the 300 pages on the Goose Prairie proposal. Half those pages are pro and con emails and letters to Board members. I think liberals have hijacked this issue to use it as a fund raiser for environmental issues. The Opponents are led by the former head of the Lake County Democrats, Nancy Hurlburt. They have used half truths and diversion tactics to frighten nearby residents when County staff appear to have addressed all resident concerns. I have attended a community hearing and a presentation at the Lake County Water Authority, and I believe this proposal to harvest peat at the location known as Goose Prairie to have merit and the Lake County Board should approve it. The Board should ignore the smokescreens by the environmentalists asking things abour private property lik "has there been a tree survey" when they know that hardly any trees will be affected by the peat harvesting project. The liberals, including Orlando Sentinel columnist Lauren Ritchie, are in stitches trying to reduce property rights to prevent an experienced peat harvesting company from Sumter County, http://www.ccpeat.com/ from harvesting peat from an old, clogged lake bed while restoring the lake to pristine status like it was in 1941. The picture is of another peat bog restored to original lake status by C&C peat. Here is the emotional, half factual 2-page flyer the liberals gave to nearby residents. The Lake County staff and Planning & Zoning Commission has approved the application for the project, thus referring it to the County Board for the next approval step. After that, approvals from other agencies and Florida State will be requested. Download 2014-04-30 BCC P&Z comm MINUTES goose prairie mine ONLY <<< These are the minutes of the of the April 30 Lake County Planning & Zoning Committee where they include all the public input then the reasons for their decision to recomment APPROVAL of the Peat Harvesting project to the Lake County Board. 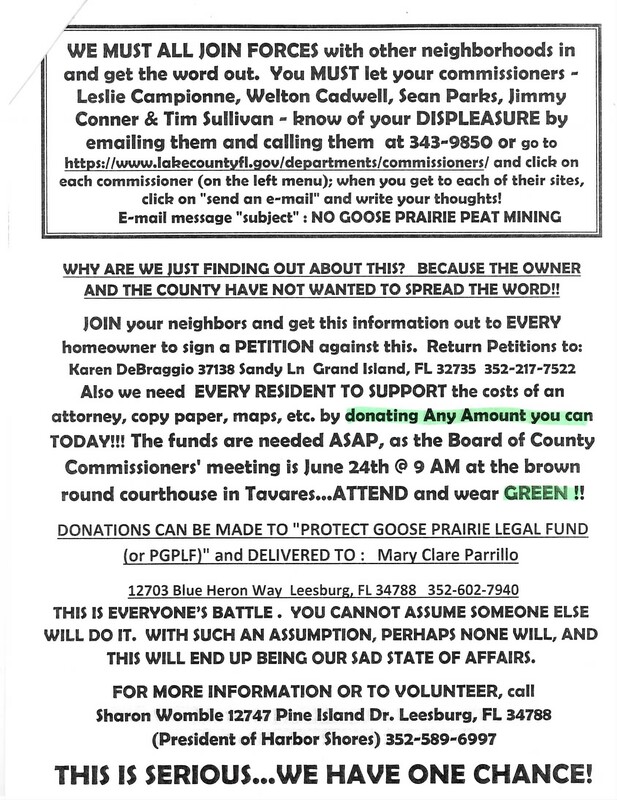 Download 2014-05-28 LCWA Goose Prairie mine agenda summry << On May, 28, the opponent liberals went to the Lake County Water Association (LCWA) because LCWA owned conservation near the project. The liberals, including former Lake County Democrat Party chair Nancy Hurlburt, asked LCWA to write a letter to the County Board recommending killing the Peat harvesting project. This is the summary of the discussion and decision by all the LCWA Board members to NOT get involved in the liberal skirmish the reduce property rights. Thus they did not issue a letter either way. In my view, this is a 300 acre area full of peat moss that once was a pristine lake. Pictures of it from 1941 are shown in meetings. 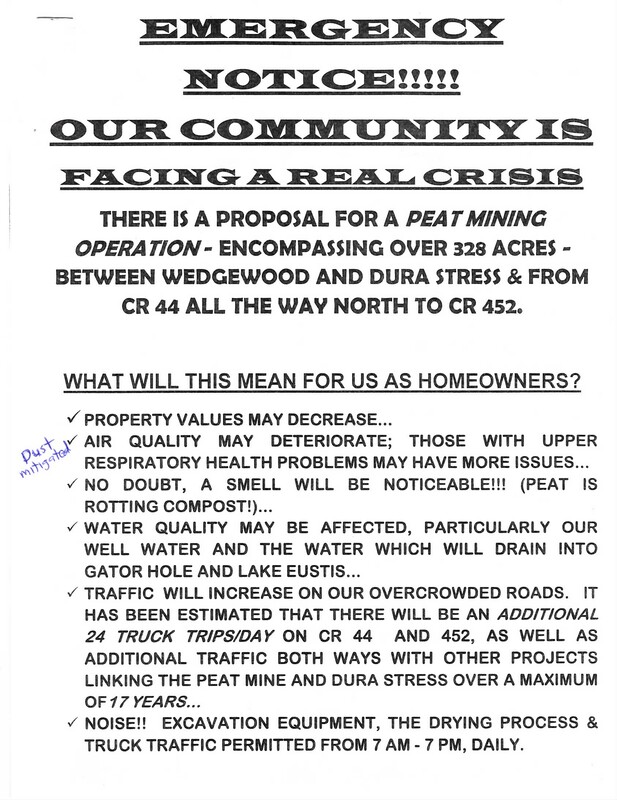 Thus the applicant, working with about 10 owners of the 600+ acres area, wants to remove the peat moss (to sell) and restore the Lake to what it was in 1941. However, nearby homeowners and environmentalists have recently been agitating for the County Board to turn down the project. As a result this is a significant attack on property rights and an attempt to reduce values by blocking legitimate Agricultural uses on the land like removing peat moss. Most of the letters asking the proposal be killed contain vague generalities and emotional statements while staff AND the applicant seems to have addressed the issue. My review today of the 300 pages of documentation in the County meeting agenda "packet" focused just on this issue indicates overwhelming support ( 188 for, vs 55 against) for the project to be approved. I have read the minutes of the Planning & Zoning Committee, and also attended a presentation before the Board of the Lake County Water Authority, plus attended a 200 person homeowners' meeting on the project to find out both sides. In my opinion, most valid homeowner concerns have been answered both by staff and by the applicant, C&C Peat. However, much of the agitation is led by known environmental activists like former Lake County Democrat Party chair Nancy Hurlburt as well as other environmentalists. They even brought a raging attorney who constantly asked non-relevant questions. One of my favorites was "Do you have a TREE survey? You can't go ahead without a TREE survey (which is not required by the process, and/or the "trees" are not in the peat harvesting area and will not be affected). Their arguments seem to be aimed at reducing property rights so that lizards and trees will not be disturbed. I personally am tired of that approach. The Lake County Planning & Zoning Committee AND staff APPROVED the project at a meeting on May 30.. The minutes are attached above. The Board of the Lake County Water Authority was asked by the environmentalists to send a letter to the County Board asking the project be turned down. However, that Board didn't believe the request was justified and voted to take no action. I made a video of that discussion HERE. Liberal columnist Lauren Ritchie wrote an early attack column on the project on June 15th, and most of her arguments are half factual or emotional. I will have an analysis of how many of her concerns are not valid. We know that a Lake Sentinel reporter is working on a story about this, but I have not seen it yet. Since the Sentinel is a liberal paper, they will probably publish it on Sunday to get environmentalists agitated or on Monday just before the County Board meeting. Our video of the 2 hours June 17 homeowner's meeting is HERE. You can see the Q&A session and other presentations, but we failed to get the video of the applicant's presentation. He will repeat most of it at the June 24 County Board meeting.